There are hundreds of heirloom tomato varieties to choose from. Some thrive in cool weather while others tolerate heat, some are tiny cherry or dwarf tomatoes while others grow to massive sizes. It can be overwhelming trying to decide which heirloom tomato varieties to grow in your garden. 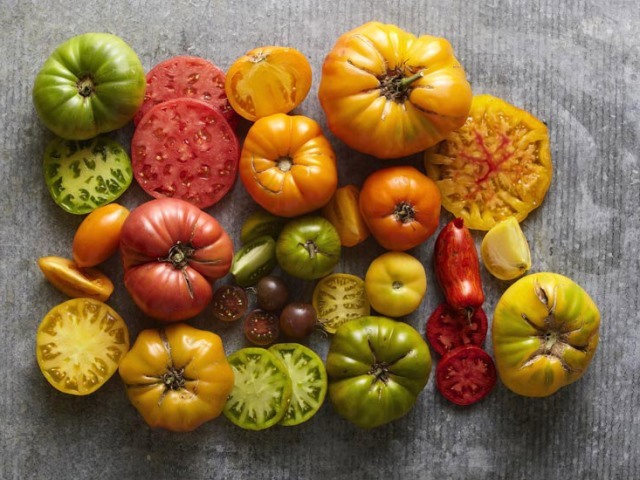 Part of the fun of growing heirloom tomatoes comes from their great range of colors. Bright green, orange, purple, striped or yellow heirloom tomatoes add a burst of color to the dinner table. This list of heirloom tomato varieties is sorted by color, to help you plan your most beautiful garden yet. Yellow heirloom tomato varieties are popular both for their rich flavor and beautiful hues. They currently a hot commodity in many restaurants. Amish Gold – These elongated plum tomatoes have smooth skin, good color and a rich tomato flavor. Kellogg’s Breakfast – A deep orange beefsteak tomato from West Virginia, Kellogg’s Breakfast will light up any salad or sandwich. Homer Fike’s Yellow Oxheart – You can’t beat the color, flavor or beautiful shape of this oxheart tomato. Cream Sausage – A pepper shaped, cream colored tomato these make wonderful tomato sauce. Green heirloom tomato varieties are ripe while still green. They have a bright, acidic flavor and make good salsas. Green Zebra – This striking green tomato has zebra stripes. These are among the most popular and best heirloom tomato seeds for sale. Green Giant – A large green beefsteak, the Green Giant is perfect on a BLT. Aunt Ruby’s German Green Tomato – This delicious Tennessee beafsteak can weigh up to a pound. Black tomatoes are not really black. They come in many colors, from light purple to a deep, dusky mahogany. They have a rich, earthy flavor and are native to a small region of the Ukraine. However, their rich, earthy flavor and startling color made them so popular that today are there many black heirloom tomato varieties. Japanese Black Trifele – One of the most popular heirloom tomato varieties, Japanese Black Trifele tomatoes have a unique pear shape and deep burgundy color. Paul Robeson Black Tomato – This black beefsteak tomato is rich in healthy anti-oxidants. Cherokee Chocolate – This relative of Cherokee Purple tomatoes has a rich chocolate color and a classic flavor. Blueberries – These tiny tomatoes are a bright blue color and have a sweet flavor with a nice acidic bite. Striped or marbled heirloom tomatoes are beautiful with a characteristic sweet flavor and very low acidity. Pineapple – Named for its sweetness this beautiful tomato is orange and red outside with red splashed yellow flesh. Gold Medal – Gold Medal tomatoes are rich, juicy and incredibly sweet German heirlooms. Big Rainbow – One of the most beautiful heirloom tomato varieties, Big Rainbows are meaty beefsteaks with sweet, juicy flesh. Don’t forget about the many delicious red heirloom tomato varieties. Just because they look like a classic tomato doesn’t mean they aren’t special. Red heirloom tomato varieties tend to be high in acid, with a bright, robust flavor. Stupice – No list of heirloom tomatoes would be complete without the Stupice, the most popular heirloom tomato for short growing seasons. It has a rich flavor typically lacking in early heirloom tomato varieties. Aussie – This big red beefsteak is an impressive old-fashioned tomato. Costoluto – A delicious meaty tomato, the costoluto makes an amazing sauce. Carmello – The French say that this tomato has the perfect balance of sugar and acidity.